A transcript and videos from the interview are available after the jump. BORGER: All right, senator. Thanks so much for being with us. And now, we’re going to go back to more of Dana Bash’s interview with Senator Ted Cruz. DANA BASH, CNN CHIEF CONGRESSIONAL CORRESPONDENT: Senator, thank you for having us in Texas. CRUZ: Dana, it’s great to be with you. BASH: What a rousing reception that you got from the women, the Republican women convention that we were just at. CRUZ: Wow. It was tremendously uplifting. It’s really good to be home. BASH: Obviously, the reason it was so startling to somebody who came from Washington is to see the very big difference between the reception you’re getting here at home and in Washington. CRUZ: Well, it’s kind of like D.C. It’s just in D.C., they’re yelling different things. BASH: But does that — what does that tell you when you come home and you get applause and you get a standing ovation and you get, you know, people treating you with such reverence as opposed to the other things that they’re taking back in D.C.? CRUZ: Look, I think people are frustrated in Texas and all across the country. People are frustrated that Washington politicians aren’t listening to them. And they’ve been frustrated for a long time. A lot of people are hurting because of Obamacare. A lot of people are hurting because they can’t find jobs. And Obamacare is the biggest job killer in this country. A lot of people are hurting because they’re losing their insurance and their insurance premiums are skyrocketing because of Obamacare. And Washington politicians are ignoring that. They’re not listening to them. And I think the reason why you see Congress at five, 10, 15 percent approval ratings is because D.C. politicians, career politicians aren’t listening to the people. And what you just saw there is people just expressing relief that somebody is actually listening to the people and trying to help give them a voice in Washington. BASH: Given that, are you planning on doing this again, January 15th, when the current bill that was just passed to reopen the government when it finishes? CRUZ: There will be time enough to talk about specific strategies, specific tactics. What I can tell you is that I think we need to keep as the top priority providing meaningful relief for all the millions of people. BASH: But you’re very deliberately not ruling it out? CRUZ: What I’m saying is the top priority — there are a lot of politicians in Washington that want to put Obamacare behind us, say OK, fine. No more. No more discussing Obamacare. And you know what? The American people are not satisfied with that. Right now, you’ve got a president who has granted an exemption from Obamacare for big business. He’s granted an exemption from Obamacare for members of Congress. The American people are getting hurt. Young people, single moms, Hispanics, African-Americans, people who are struggling and they’re losing their jobs, they’re forced into part-time work. They can’t afford their health care or they’re losing their health care. What Congress is saying is we’re not going to do anything to help you. We caused the problem and we’re not going to fix it. And my view, we need to keep as our priority providing real relief for the people who are hurting because of Obamacare. BASH: As you well know, your fellow Republicans pretty much unanimously agree with you that they want to get rid of Obamacare, but they just realize that it’s impossible to do with a Democratic majority in the Senate, with a Democrat named Obama in the White House. Mitch McConnell, your leader in Washington, says it’s not going to happen again. There will be no government shutdown ever again as far as he’s concerned. And he hopes that the newer members, like you, you’ve been in Washington only ten months, have learned a lesson. Doesn’t sound like you learned a lesson, senator. CRUZ: Well, I’ll tell you, the lesson I’ve learned is that what we’ve seen in the last couple of months has been extraordinary. We have seen millions of Americans rise up. Over two million Americans signed a national petition to don’tfundit.com and melted the phone lines down at Capitol Hill. Just a couple of months, official in Washington scoffed that that might happen. We also saw the House of Representatives stand up, exercise a profile of courage, listening to the people and saying, we’ve got to provide real relief from Obamacare for the people who are being hurt from Obamacare. That, again, a couple months ago, all of official Washington said would never happen. Now, the reason this failed was simple. Senate Republicans didn’t unite. You know, you mentioned that you don’t think this could ever succeed. Let me ask you a hypothetical. Imagine this same battle played out with one thing different. Imagine if after the House had passed a bill funding all of the federal government but defunding Obamacare. Imagine if Senate Republicans had come together, had United and had stood side by side with House Republicans and had said we’re with the American people. We want to fund our government. We want to fund every aspect of our government, but we want to answer the American people who are being hurt because of Obamacare. We would have ended up with a very different result. The deal this week was a lousy deal for the American people. BORGER: And coming up, Senate Republican leader, Mitch McConnell, said that Ted Cruz tactic, quote, “was not a smart play”. Cruz’s reaction to that when we come back. BORGER: We’re back now with more of CNN’s chief Congressional correspondent, Dana Bash’s interview with Texas senator, Ted Cruz. And this time, the topic turned to money and politics. BASH: There is a group that you’re well aware of maybe people out there aren’t necessarily called the Senate Conservative’s Fund. It helps defeat GOP incumbents or help people who are running against GOP incumbents. You actually benefited from that last time around. They raised $2.1 million in September. An enormous amount. This is not an election year, on the heels of this fight on your 21-hour filibuster. And some of your colleagues think that that’s what this was about, that this was a ruse to raise money for this group and others in order to take out your fellow Republicans. CRUZ: You know, Dana, it is amazing how many people in Washington want to focus on politics at the expense of all else. BASH: Do you deny that? Is that not true? CRUZ: It’s nonsense. But here’s the point. Look, talking about that is for a purpose. It’s a deliberate strategy and what the strategy is is to change the topic. What they don’t want to talk about is Obamacare. They don’t want to talk about the substance of Obamacare. BASH: But you made a lot of money — was it a money making enterprise? CRUZ: Not remotely. And listen, this is a deliberate strategy. The strategy in Washington is to launch personal attacks, some of which you read, and to encourage the media to do what a lot of folks in the media like to do which is cover this like it’s a Hollywood gossip column. This politician versus this politician. Who’s up? Who’s down? Who’s mad? BASH: Sir, you’re the one who’s starting to choose sides against your own colleagues. CRUZ: No. What I’m choosing sides with is the American people. And what I think the focus should be is on Obamacare. Is it working? You know what’s striking? In the last two months in the course of this debate over Obamacare, Democrats aren’t defending Obamacare. They’re not saying, hey, these things working great. They’re not saying, hey, it’s not killing job. They’re not saying, hey, it’s not forcing people into part time work. It’s not driving up health insurance premiums. It’s not taken away people’s health care. And the reason is you can’t defend it. On the merits, I mean, there’s a reason, Dana, the unions are jumping ship. They’re saying let us out, it’s not working. There’s a reason Democratic senators went to the president and said we want a special exemption for members of Congress because it’s not working. And so, I understand you want to draw me into the back and forth with other Republican senators and that’s fun to cover. I’m not interested in playing that game. Do you know what many of the elected officials in Washington are most upset about is that their constituents were calling and holding them accountable. I can’t tell you how many of my colleagues have expressed outrage to me that my constituents are calling me. Dana, we work for our constituents. That’s our job. BASH: But the reason they’re frustrated, the constituents, they’re calling them is because senators have said this to me, because they thought you were selling them snake oil. It was never going to happen. CRUZ: You know, they can insure we can’t win this fight by going on television constantly and attacking everyone who’s standing up to win this fight. That made certain we couldn’t win. BASH: Let’s chill down on what some of your colleagues seem to be most upset about. First of all, you referred to the fact that your colleagues were yelling at you red faced about their constituents calling. There were a lot of very animated private lunches with you and your colleagues, correct? BASH: Let me just ask you about this, because one of your colleagues told me it was like an intervention, that there were so many of your colleagues saying, you know, why are you doing this? And really angry at you. And I’m just wondering even on a human level, they told me that you really didn’t flinch. On a human level, that’s got to bother you, to be sitting in an institution like the Senate and having your, not Democrats, fellow Republicans, so angry at you. CRUZ: Because the people I work for are the women and men you just saw. I work for 26 million Texans. That’s my job to fight for them. I don’t work for the party bosses in Washington. I work for the people of Texas, and I fight for them. The reason people are frustrated all over country is that far too many people get elected and they think they’re there to be part of the club. You know what was very interesting about some of those closed door discussions? What I said in those closed door sessions, I would have said the exact same thing if CNN’s camera were sitting in the room. What I say privately to my colleagues is the same thing I say publicly. And you know what’s interesting? Virtually, every person in that room that was criticizing what Mike Lee and I were doing would have said very different things if the camera was in this room, because what they’re telling their constituents is very different from what they’re saying behind closed doors. BASH: Do you think Mitch McConnell has been a good leader? CRUZ: I think Senate Republicans should have united. Senate Republicans should have united and supported House Republicans. The one hypothetical that I really think is worth thinking about is how would this have played differently if when the House stood up and led Senate Republicans had marched into battle side-by-side and said we are united and saying we should fund government. But we should not fund Obamacare. Now, one of the things that might have played out differently, one of the most revealing exchanges and an exchange you were a part of when you asked Harry Reid about the funding for NIH. When the government was shut down, the House passed 14 bills to fund vital government priorities. The Democrats objected to all of them. They sat on Harry Reid’s desk. He wouldn’t allow a vote. Every one of them was a clean bill. So you had a bill to fund the veteran’s administration. BASH: They were successful. They beat you all back. BASH: Sorry, I’m a big girl. CRUZ: I have no doubt about that but you know why he attacked? Because he was vulnerable. The position he was saying was unreasonable. President Obama and the Democrats’ position throughout this was, we will not negotiate. We will not compromise. Shut it all down. That’s not a reasonable position. Now, if Senate Republicans had united and supported House Republicans, if we had 46 Senate Republicans on television every day, in the media every day making the point, why won’t they fund the V.A.? Why are they holding our veterans hostage? Why won’t they fund the NIH? Why are they holding kids with illnesses hostage? That’s a fight we can win because their position was unreasonable. On the other hand, what we did have is we have half the Republican conference on TV not making that point but instead making President Obama and the Democrats’ point attacking the House Republicans, attacking those of us trying to stop Obamacare. That is a recipe that necessarily leads to losing. I hope going forward we don’t follow that same path. BASH: When do you make your intentions for the White House known? BASH: What time is it? 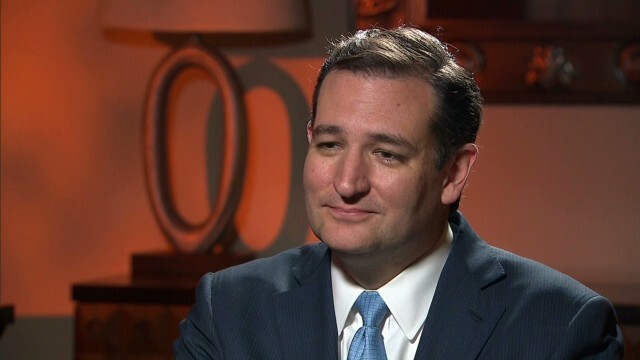 CRUZ: My focus is entirely on the U.S. Senate. It’s on substance. I get that everyone wants to talk politics. BASH: Well – and you know, some trips to some of the first primary and caucus dates may be a little hints. CRUZ: But you know, look, there’s a reason for that which is the only way to win this fight and for that matter to win some of the other fights we’ve had is to energize and activate the grassroots of the American people. I’ve traveled all over the country the town halls and rallies to make the case to American people. You don’t get two million people signing a national petition without going directly to the people. And what we’re trying to do, listen, I think what we’re trying to do is bigger than the economy, than the budget, bigger even than Obamacare. What we’re trying to do is really change how Washington operates. The reason people are so frustrated is career politicians and both parties, they aren’t listening to you and even more than that, the American people have the sense for good reason the system is rigged. BASH: Senator, thank you. I have to ask you one newsy question before I let you go. Kathleen Sebelius. Some colleagues are saying she should resign. Do you agree with that? CRUZ: Absolutely she should resign. Why? Because the program she implemented, Obamacare, is a disaster. It’s not working. It’s hurting people all across this country. BASH: But isn’t that helping you politically? I mean isn’t that help you make your point that it’s not the right program or policy? BASH: And they think you’re stepping on their message. CRUZ: And then Republicans will benefit. Now look, I profoundly disagree with the message. I want to step on their message. Number one, you know, I consider that very — the bad scenario here. Basically inflict a bunch of harm on the American people and hope we benefit politically from it, what a terrible cynical approach. I’m not interested in seeing the American people suffer just because my party might benefit politically if they blame the Democrats for the foolish policies that have been imposed. BASH: Senator, thank you for your time.